Cataract service of CPEH is well known across the country for its advance technology based surgeries and many innovations. Equipped with one Carl Zeiss LumeraT, one Zeiss Visu 150, one Leica 550 & one Topcon OM75 operating microscopes this centre is famous for its excellence in Micro Phacoemulsification surgery. The centre has one Alcon's Infinity phaco system, two Loriet and one Legacy phaco machine.All the cataract surgeries here are done by phacoemulsification technique only. Even the free surgeries done on poor patients are done by phaco technique only. Regular Micro Coaxial Cataract Surgery has been done here since 2008. All surgeries are done here under topical anaesthesia. Of late Dr Bordoloi performs Phaco surgeries without use of any OVD. Named as "Pure Phaco". This technique is presented in ASCR Film Festival in Boston, April 2014. 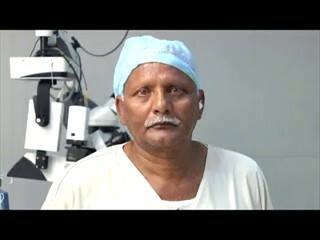 This is the only centre in the world which does this procedure in every routine cataract surgery. Since 2009 the centre has stopped prescribing steroid eye drop in post operative cataract patients. This is the only eye centre in India which follows this steroid sparing post operative regime. Besides using exclusively Alcon's Acrysof foldable IOL this centre also provides premium IOL facilities to its patients. Aspheric IOL like Acrysof IQ, Toric IOL and Multifocal IOLs are regularly implanted here. The centre is also famous for Scleral Fixated IOL technology to help those patients who don't have a support for implantation of Posterior chamber IOL. Complex cataract surgeries like Subluxated cataract, Traumatic Cataract, Combined Cataract with Glaucoma, Catataract with Penetrating Keratoplasty, Cataract with retinal surgery are successfully performed at this centre.